Cheryl from Nap Time Quilter is here today sharing one of her favorite tools in the workroom. I am kinda giggling, this is another one those tools that was never on my radar, the Kwik Klip. I’m going to chalk up my lack of knowledge on this quilter’s tool to my apparel background and call it a day. Love learning new things! Cheryl and I crossed paths earlier this year at spring market in Portland. I was instantly drawn to this easy going, relaxed gal who shares my passion for stitching. After a long day at market we ended up hanging for dinner at a local watering hole. We spent the night eating crazy bar food, kicking back local brews and chatting up a storm. 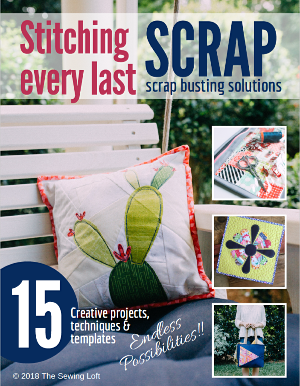 This environmentalist turned quilter has some crazy street cred in the stitching world! 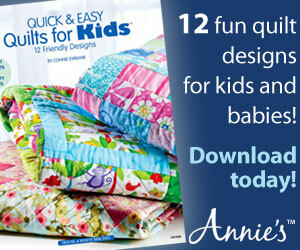 A few of her latest achievements include Craftsy Instructor, Author and all around Awe-Some Mom! Seriously, this is one talented Mamma! My least favourite part of quiltmaking is basting quilts. It really is the reason quilt tops languish in my closet. I think I’m slow at it, that’s part of the problem. And now, with our TV in the basement, I can’t rope Hubby into helping me anymore! I baste on the living room floor. When the TV was up here he had no choice – watch me get in his way or get on the ground and help me. Now he runs away to the TV as soon as he sees me pull out the masking tape and pins. 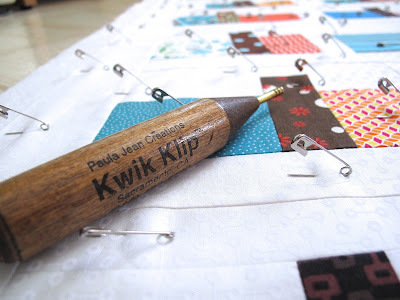 Honestly, if it wasn’t for a Kwik Klip none of my quilts would get basted. I am a pin baster, and I use a lot of pins. (I didn’t think it was a lot, but then I saw people commenting on an IG photo of someone else’s basted quilt. So many pins! Wow, you sure use a lot of pins! And there I was thinking that it looked totally normal. But I don’t get puckers with my quilting. Happy for that trade off.) So the Kwik Klip makes very short work of closing all those pins. And it saves both what is there of my nails and my fingertips. You simply hold the tool in your dominant hand, lift up the straight part of the pin, and clip it into place. Done. I’ve heard of people using an old teaspoon to the same effect. That, however, is not as fancy as the tool. And seriously, if a tool is what it takes to get your man to help you with the basting then a tool is what you should get. Woo Hoo! I am thinking this tool is going to save some sore thumbs along the way. To make sure, I wanted to this baby in action! So, off to youTube I went and this quick one minute video explains a bunch! This Kwik Klip tool looks like a must have for any quilters out there. Stay tuned…. more fun tools and prizes to be revealed next week! National Sewing Mont is one series that you do not want to miss. To have the latest posts delivered to your in-box sign up here or follow us on Bloglovin’. OMG!! Who knew>> Thanks for sharing this tip. Thanks for the tip and the video. Nice to see it in action.